Nigeria's President Muhammadu Buhari has missed his third cabinet meeting in a row amid ongoing questions about the state of his health. There are concerns about a leadership vacuum as one of Africa's largest economies struggles to pulls itself out of recession, correspondents say. Information Minister Lai Mohammed said Mr Buhari "needed to rest". In March, Mr Buhari returned from seven weeks of sick leave in the UK where he was treated for an undisclosed illness. When he returned home he said he had never been so ill in his life. 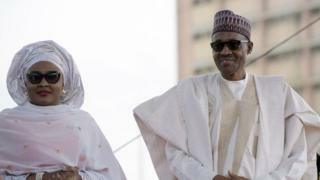 To calm fears, the president's wife Aisha Buhari tweeted on Tuesday that her husband was not as sick as is being perceived. But as he has not been seen in public for more than a week, Nigerians are continuing to discuss the issue. Should Nigerians be worried about their president's health? Do Nigerians go on holiday? In her tweets, Mrs Buhari said that the president was continuing to "carry out his responsibilities" and has been meeting with ministers. Mr Buhari has rarely been seen outside of his official residence in the eight weeks since he returned from the UK. But the real controversy began when he stopped attending an important weekly cabinet meeting four weeks ago. #WhereisBuhari started trending online and the writer Wole Soyinka, as well as prominent civil society activists, is calling on the president to release his medical records and to take official medical leave once again. This is a crucial year for Nigeria and important decisions need to be made as the country struggles to get out of recession. The presidency is keen to assure the public that Mr Buhari is still very much in charge because a power vacuum, or even the perception of it, could have very damaging effects. Vice-President Yemi Osinbajo, who was the acting president while Mr Buhari was away in the UK, chaired the cabinet meeting in the capital, Abuja. On Monday, a group of prominent Nigerians has called on Mr Buhari to take medical leave as concerns about his health grow. They said in a statement that the president's absence from the cabinet meetings, as well as the weekly Friday Muslim prayers, "has fuelled further speculation and rumours" about his medical condition. The 13 said they felt "compelled" to ask Mr Buhari "to heed the advice of his personal physicians by taking a rest to attend to his health without any further delay". Mr Buhari's personal assistant Bashir Ahmed said the president had met Justice Minister Abubakar Malami and other officials at the presidential villa on Tuesday as part of his official duties. Last week, presidential spokesman Garba Shehu said Mr Buhari was "taking things slowly, as he fully recovers from the long period of treatment" in the UK. 26 April: Misses second cabinet meeting and is "working from home"